What if we just let it all go? 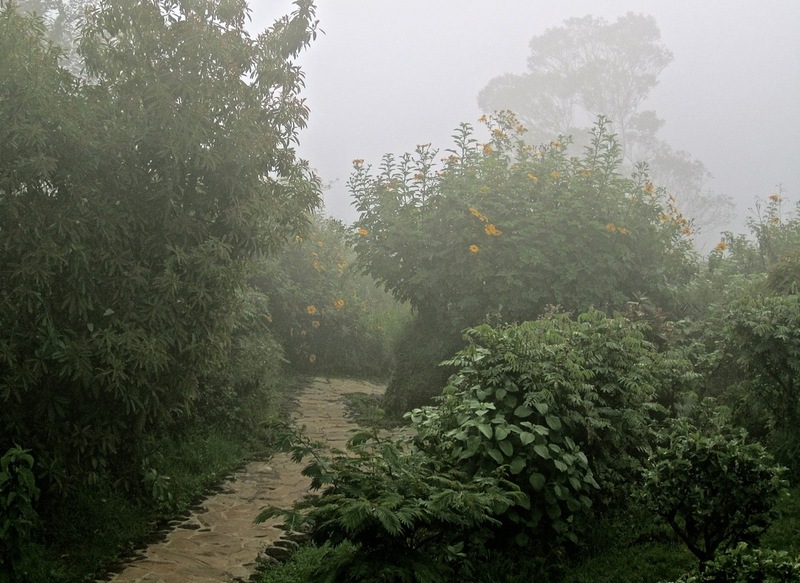 Virunga Safari Lodge in early morning fog. Just cut paths through the brush and then beautifully paved them? Pushed out a few garden rooms with low walls and columns built of local stone? Mowed the grass only in those small spaces? Gardened (sometimes) with a machete, not hoes and shovels? A terrace overlooking the wild hillside, the roofs of cabins in the background. That’s what I kept thinking during our overnight stay at the Virunga Safari Lodge in northern Rwanda a couple of weeks ago. 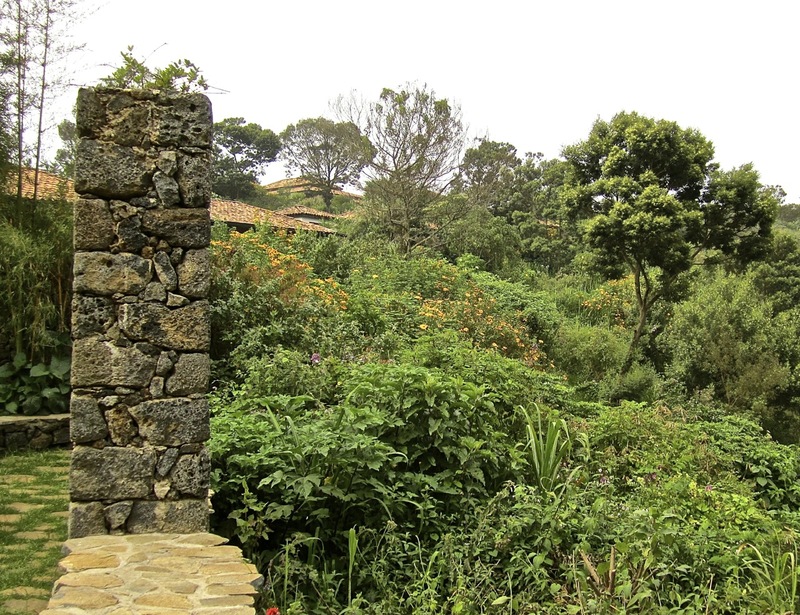 Path to the local village beyond a wall. The hotel consists of a main dining/lounge building and eight very private cabins. 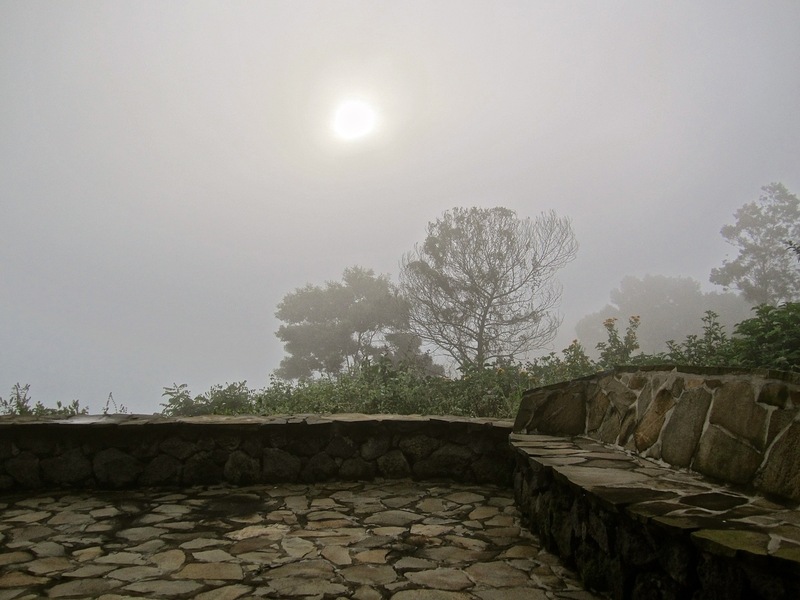 The stone terrace and bench of our cabin in morning fog. A central path through the hotel grounds runs along the top of a hill, and the cabins are sited on both sides on a level below. The roof of our cabin. 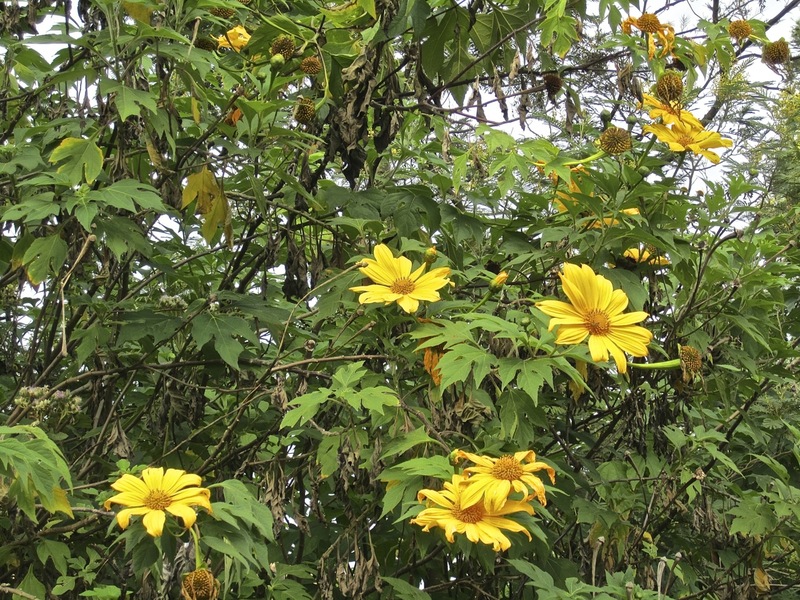 In the brush, wild natives and naturalized exotics grow together in a jumble. They were noisy with birds and insects. 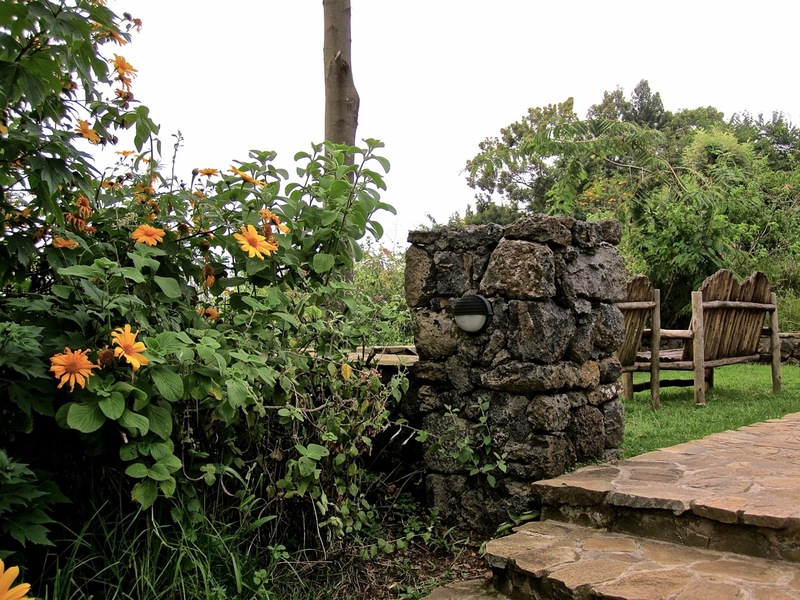 As we took a walk through the neighboring community, I realized that the light-touch landscaping of the hotel grounds created, in a sense, the least artificial environment in the area. 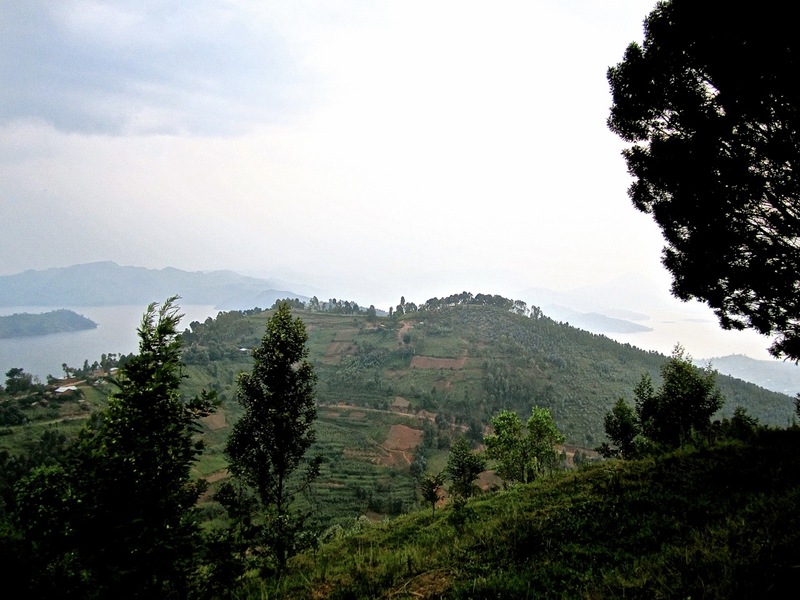 Rwanda’s country land is highly cultivated — almost every square foot is part of a vegetable garden or field or wooded plot for timber. A steep slope is rarely an obstacle. Fields on a nearby hillside. 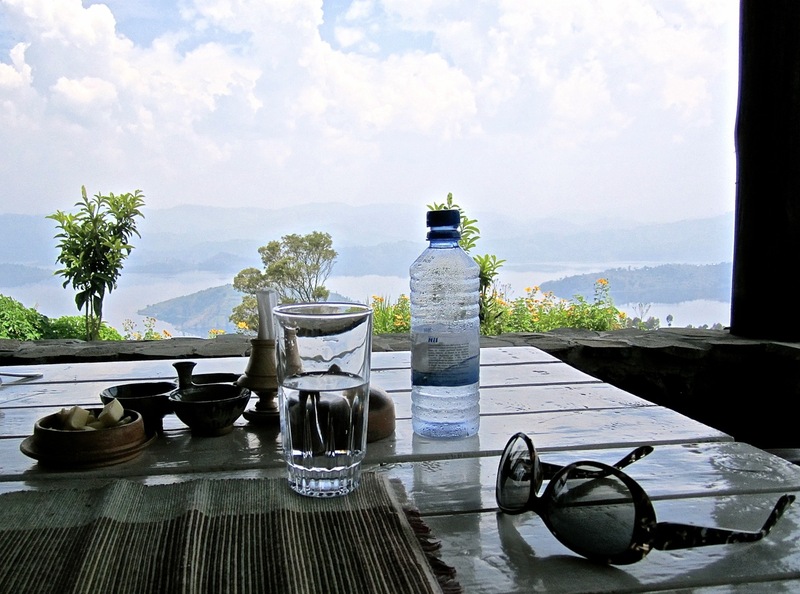 At the end of a relaxing stay, we had lunch at a table overlooking Lake Burera and its little islands. Then we were off on the 2-hour drive back to Kigali. It’s sad to leave Eden. View of sunflowers and the lake from our table at lunch. To scroll through larger versions of these images (and several more), click ‘Continue reading’ below and then on any thumbnail in the gallery. 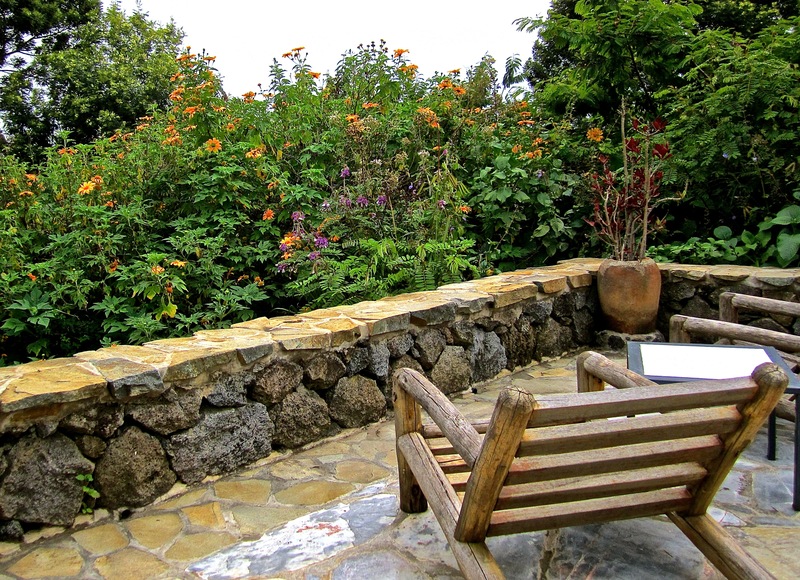 To see more photos of Virunga Safari Lodge from a brief visit last year, click here. A path in the early morning fog. Sunflowers growing along the paths between the cabins. Sunflowers at the entrance to a garden room. 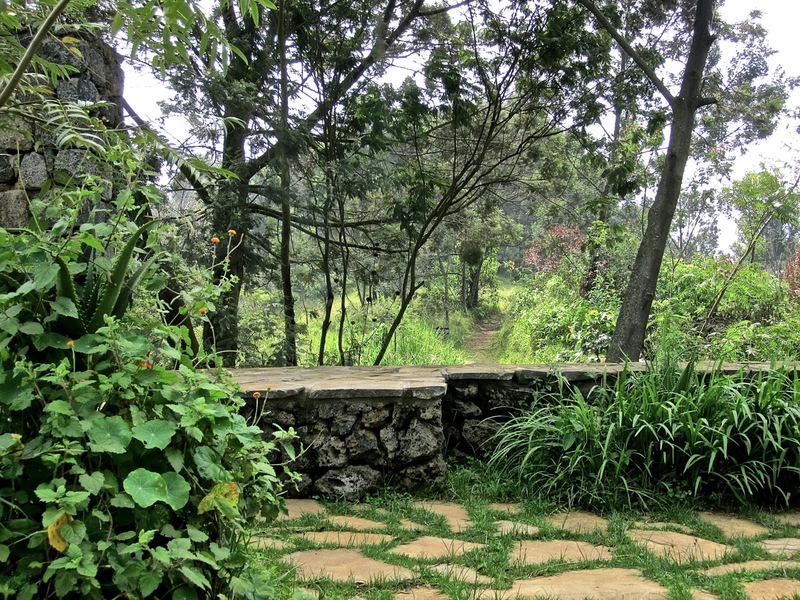 The central path crosses a garden room. Wildflowers on a volcanic rock wall. A terrace overlooking a wild hillside, with cabins in the background. Overlooking the lake at dusk. 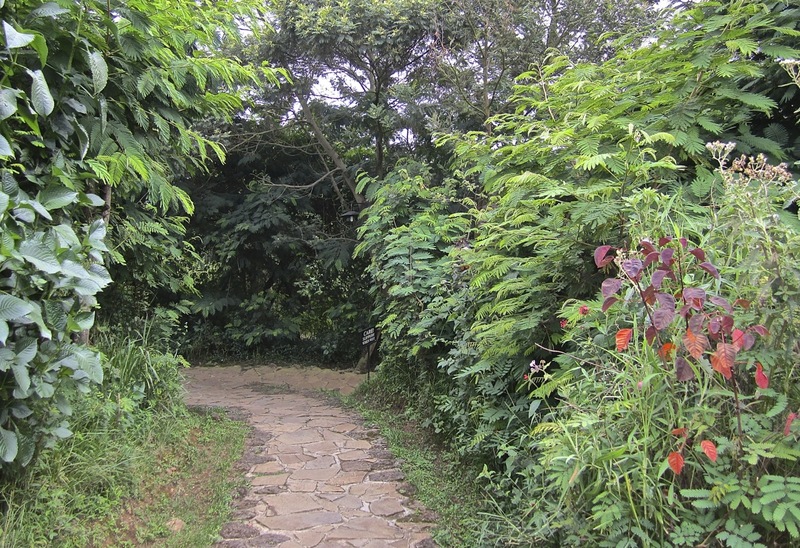 The path to the local village. Sunken garden in the fog. The stone terrace of our cabin in morning fog. A beautiful slug on a plant near our cabin. The terrace of the main building. The view from the picture window in the bathroom. Morning coffee or tea is brought to the cabins at the guests’ requested times. 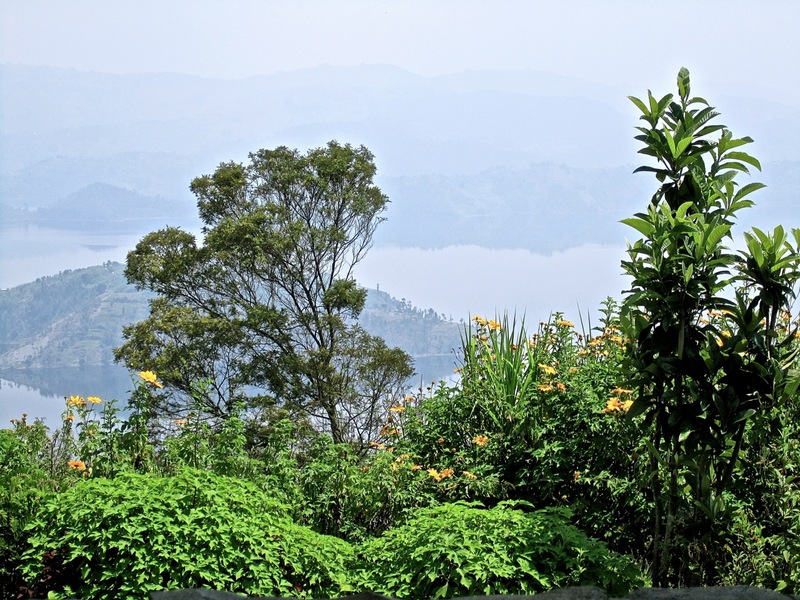 Many guests rise at 5 a.m. to hike to see the mountain gorillas on the nearby volcanoes. It’s really beautiful. But I wonder who takes care of it. Surely there’s someone who watches and directs, to some extent? I imagine there are several gardeners who cut back the edges of the paths and mow the small bits of lawn — the hotel is very well staffed. Someone had cut back some shrubs near the main building — not very expertly, but in this climate they are probably leafed back out already. I need to find out who originally designed the paths and walls and terraces. On thinking about it a little more, I think the place is actually designed to be taken care of by people with very basic gardening skills — there’s no designer stopping by regularly to fluff. The structure and, really, formality of the paths and walls makes it work — makes it readable. 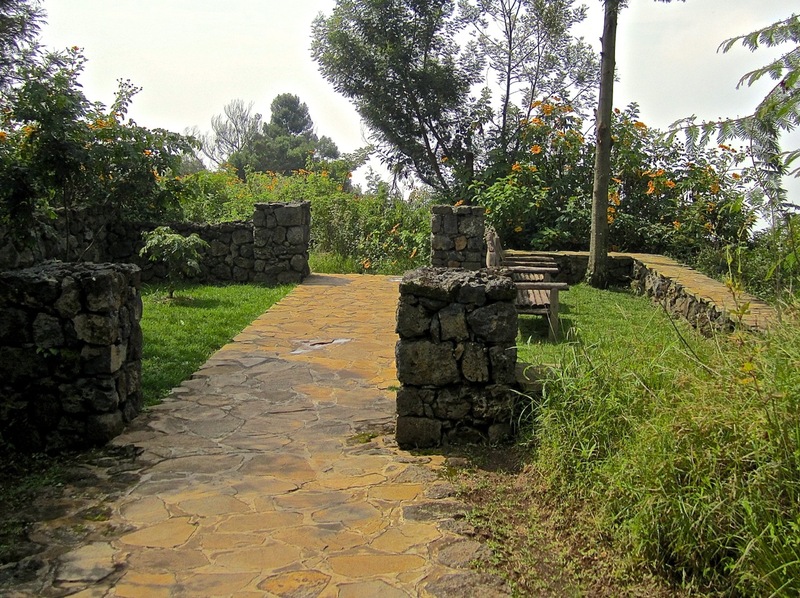 I kept thinking of the work of Edwin Lutyens while we were there — as if he came to Rwanda without Gertrude. It does look lovely, and effortless in the way the best work is done. 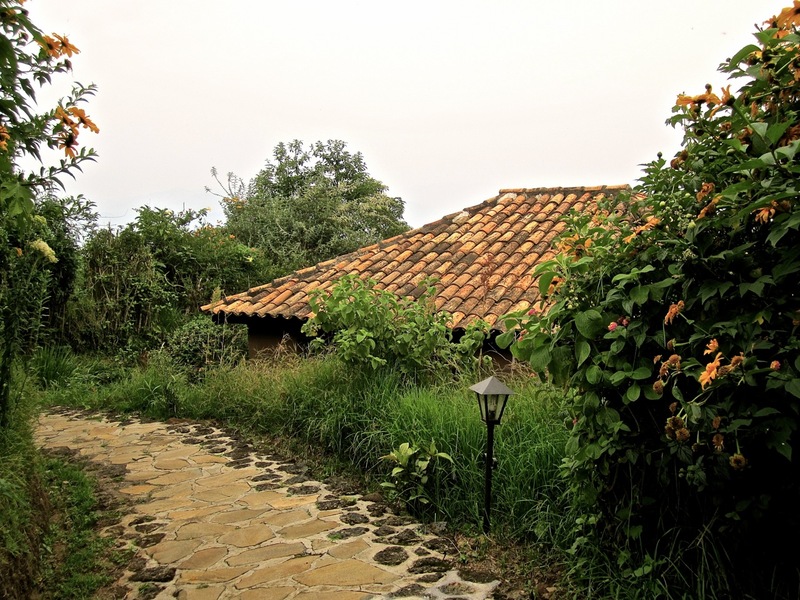 I imagine it is labour intensive – to keep the wide paths open, the paving free of noticeable weeds, the tree seedlings from intruding where they are not wanted. I see why you think of Lutyens–all that stonework.